Between the desktop and the iPhone apps, I couldn’t be happier - and the improvements keep coming. This is the easiest and cleanest astrological app I’ve found to date. Highly recommend. Best portable chart drawing app! Longtime fan going on what, 8 years?! Keep up the great work!!! Thanks for the quick fix on last two updates! At first glance this app seems promising but it is entirely a waste of time. Get Any app EXCEPT this one. You pay a hefty app charge & still get nothing with the chart reports! It require $3 charge per chart. You’re basically going to stare at a picture of your chart that you should’ve googled instead. Any other app will have a more informative, efficient, and functional platform. The latest update destroyed all charts! Unbelievable! It does not work!!!! I made the mistake of upgrading to this version on both iPad and iPhone 5S. On my iPhone, it exits every time I try to view a chart. I cannot even open Astro Gold on my iPad. 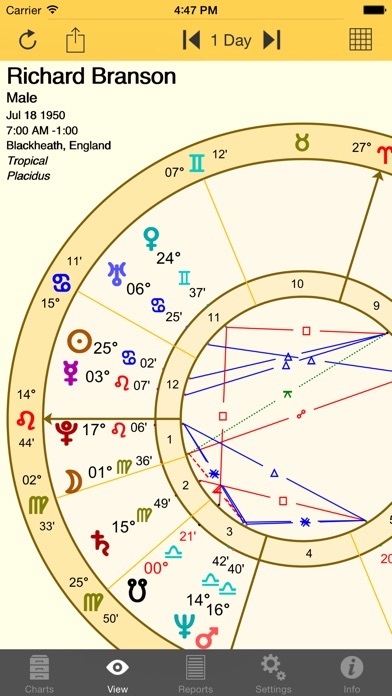 I am referring to the astrologers who use pre-twentieth century astrological references and techniques (not that classical astrologers ignore the developments after 1900). This app provides some nice options regarding what triplicity, face and decans one wants to use (Egyptian, Ptolemy, Lilly) and uses the traditional aspects (planetary aspects as opposed to the aspects themselves). The tables of essential dignities as well as other tables are very nice. I also have the Mac OS version. Kudos to the developers! A good app except that it consistently crashes when scrolling through the transit list. This needs to be fixed. Best astrology app for Mac. I hope they include Eris in the next version. Then it will be perfect. A fantastic App. An astrologers dream. Calculates Natal, transits and progressions. Includes ephemeris, atlas and reports. Who would have thought,10 years ago, that you could have carried a pocket chart maker. Absolutely professional software. Great accuracy. Developer keeps making improvements. Could not be happier. Highly recommended! This app replaces my desktop software that cost 10 times as much. I've been using this since it came out (decades long user of Solar Fire). Like that new features are added. I do love this app, but it would be even better if there was a 'Comment' field for charts like in SF. Please add. I tried to download the new update & now there is some weird dialogue about it not having an iTunes receipt. Help? I am writing a review to express my gratitude that this app is constantly improved. It provides great, detailed charts. The author adds new features regularly and makes this even better. Who could ask for more? This app is like a dream come true for me. With it I can finally give instant readings, with chart and transit listings. The app is very adaptable to the astrologer’s preferences. It took me about a half an hour to learn the program. AstroGold is a good name for it, Pocket Gold Mine is almost just as good. this is the best astrology app you can find in the app store, I have been using it since version 1 and I'm very happy with it, one thing that I'd like to see added to it is the time-line format to visualize transits and progressions, that alone would be an outstanding feature to have, thank you. I had a technical question and contacted customer service. They did not even bother to acknowledge my question, let alone help me. Don't waste your money on these thoughtless unhelpful jerks. Would love better, longer interpretations including for the nodes, asteroids, etc. 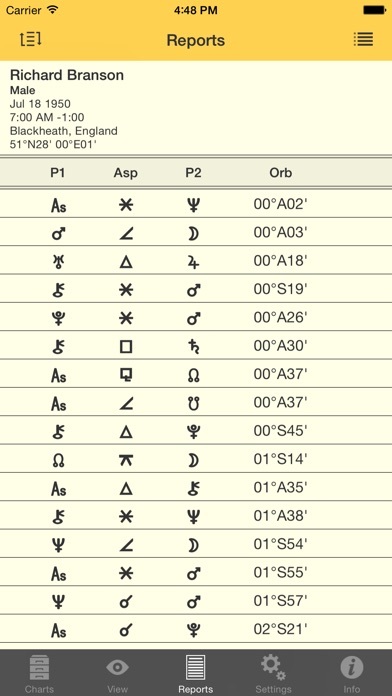 When pulling a report, the planets symbols are replaced with other strange symbols and numbers. Otherwise, the app is great and an excellent backup to the full-length computer program. I use this app for my daily astrological research and readings. It will do almost anything a major computer astrology program will do. The developers are working on adding more features that will take this app to a point where we would rarely need to use pc software to read charts. I would gladly buy upgrades to this app in a heartbeat if made available. It’s a great app, but there seems to be a small bug... Certain aspects such as quintiles, septiles, etc won’t load on certain “Aspect Sets” even if the aspects are turned on for the Aspect Set. It’s not every Aspect Set that has this bug, only a few. Also, if you could add Makemake, and possibly Phollus and Nessus, this would be a perfect 5 star app! When I go way back to see the planetary transits for the year 1200 or so and I try to go forward by a month, it by default goes back to the year 2000! So I can't go from January 1200 to February 1200. It instead goes forward all the way to Jan 2000. Please fix! Although this app is very thorough, it's for professionals only. The interpretations are very vague. It would be almost useless for beginners. However, if the developer would add more thorough interpretations (which should be easy) it will be perfect. Used the app yesterday and it was fine, yet today, I cannot view anything. It just crashes. Best of the Best, but 4 of 5. Full screen landscape mode for the horoscope would make the app more functional. In portrait mode the app looks excellent, but flip the iPad to landscape and you get that big, cumbersome menu that won't go away. Still an excellent investment. So glad I paid $40 for this back in Q2 2012. Unquestionably an outstanding tool for the serious student of astrology. What I like best is the way it lets me customize everything to my tastes. I use really tight orbs for aspects and this does just what I want. I like this app a lot but it does not show the planets when they are in Retrograde!! That's very important!! It's handy to run charts on the go. However to keep logging into Apple account is a distraction. You pay $39.99 upfront only to be confused and finally figure out the reason it’s not working is BECAUSE you have to pay up to $1.99 - $3.99 per transit reading. The developers of this app should be soon because they are no better than people who go around scam in the elderly and taking all the money they have. You guys should be ashamed of yourself I am a professional astrologer and I was curious on what other astrologers were using. I will stick to creating my own shorts with my own mathematical skills because clearly if people are using you for their astrological readings than I have the advantage. Why don’t you give people what they pay for it and at least give them each transit for free considering they pay you $40 for nothing. All of you should be ashamed of yourself who all of you behind this. You are a saint. Don’t even try to talk to me I am disgusted with you. Thank you for the quick fix of the bug in 3.2.4. V3.2.5 looks great. Very, very nice app! This app has several, major problems. First, not all the features work. Only randomly. Second, even with cryptic instructions from the app's tech person, it is difficult to figure out how to synch the Astro Gold IOS app from an iPhone to an iPad, and back! This app is not fully developed and is NOT worth the price!! I love this app I use it everyday, I just updated it today and it crashes when I hit view. Please fix soon. People complain about the small print screens charts! !, it's going on 2 years since Astrogold's release, this is a must feature!!! This is from the makers of Solar Fire for the desktop. Remarkably full featured for the price and very easy to use. They are constantly improving it as well. If you're serious about astrology this is probably the best program out there for the iPad....it also reads Solar Fire data files. Having studied astrology now for sometime it's surprising to me that these programs do not include the south and north node of every planet. In fact, they all tell a story and are just as important as the lunar nodes! If you are a Solar Fire user, you are going to love this app!! It is a powerful app that allows you to easily access a breadth of astrological data and with a user interface that is simple and straightforward. This app has been created by a company that has produced high quality astrological software for years and they have poured all their experience and expertise into this latest offering. If you are a practicing astrologer, give this app a try! You are going to love it!! I was apprehensive about making the purchase, but it has turned out to be a very good value. 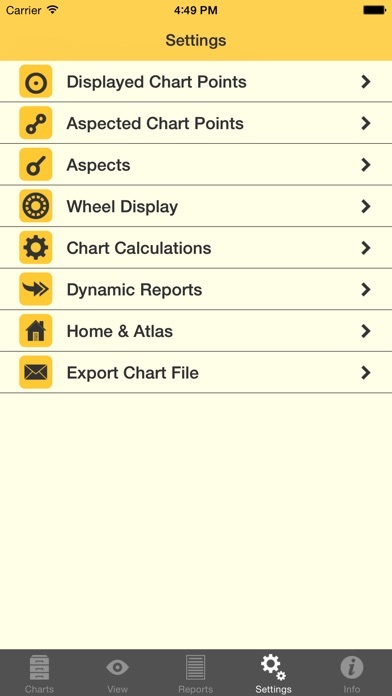 Astro Gold is a surprisingly comprehensive app loaded with very useful features. It takes a little time getting to know the interface and how to really get the most out of the app, but once the minor learning curve is surpassed, it becomes a very powerful tool. The interpretation text is concise but very thoughtful. In my short time with the app, there have been several updates that include expanded content - I look forward to seeing how the team will make the app better and better as time goes on! This is one of the best astrology apps in the App Store, hands down. This app is worth every penny! I absolutely love how convenient it is to cast charts and check current transits. I'm pretty sure I use it every day! Everything I've ever wanted in an astrology app. App has been excellent. Unfortunately the most recent update causes it to crash on launch on iPad iOS 5. Hopefully a fix will be issued very soon. I use it all the time. It really is a well done app. Thank you! 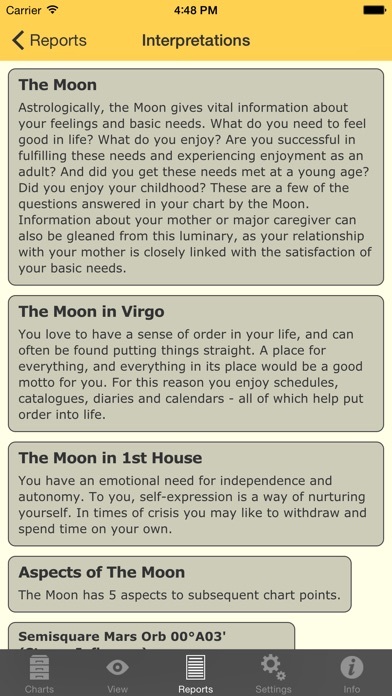 One would think that the average user of this app would want to create a natal chart as the initial activity. Good luck trying to do that. The user is initially shown two transit charts for a location in Australia. It is not clear how to get rid of them, how to create a natal chart, or how to do anything useful. The only way I could find to create a natal chart was to save one of the transit charts then edit it as a natal chart. Next, I changed the default home location in settings. Then, after far too much time and effort, I got a proper natal chart with correct transits. While this program seems to have useful capabilities, the user interface is very poorly done. It appears to have never been tested with real users prior to release. With a complete interface redesign, it might be worthy of 4 stars. As is, Time Passages Pro is a better choice.